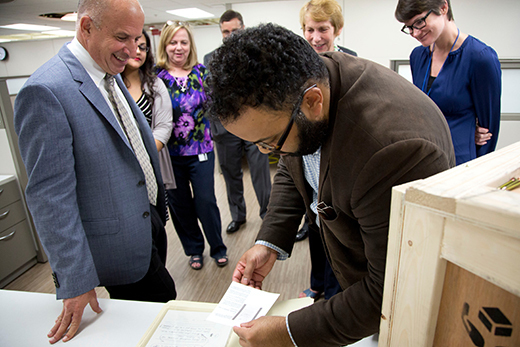 In the photo: Stuart Rose (left) and Kevin Young look at materials from the Rose collection with members of the MARBL staff. It’s one thing to read a poem by Sylvia Plath in a published volume from a library or bookstore. It’s quite another to see the typed version from Plath’s manual typewriter with a handwritten note by her husband, poet Ted Hughes, across the top of the page. At Emory’s Manuscript, Archives, and Rare Book Library (MARBL), you can. For anyone who loves literature, this and other manuscripts and photos recently acquired by MARBL are breathtaking. Made possible by charitable gifts from Emory alumnus Stuart Rose 76B, a longtime MARBL friend and patron, the materials include a rare unpublished poem by John Clare and drafts of works by Plath, Hughes, Samuel Beckett, W. B. Yeats, Seamus Heaney, and Derek Mahon. Purchased from the Roy Davids Collection at Bonham’s Auction House, the materials offer “a beautiful glimpse into these writers’ lives that you don’t get from a book or a film,” says Fraser, coordinator of programs and administration at MARBL. The acquisitions include approximately 70 rare photographs of Assia Wevill, who had a six-year relationship with Hughes; MARBL acquired Wevill’s writings, art, and dozens of letters several years ago. Young, who curates MARBL’s literary collections and its Raymond Danowski Poetry Library, says the new materials reflect the archive’s strengths in contemporary and modern poetry—such as Heaney, Hughes, and Eliot—and complement MARBL’s lesser-known strengths in 19th-century literature. “I’m particularly excited by a wonderful, handwritten poem by John Clare, who was a Romantic poet treasured by many, and the only known poem by Thomas de Quincey, a writer more famous for his prose,” he says. Emory’s Atticus Haygood Professor of Creative Writing and English, Young has published seven books of poetry and edited eight others. “All in all, materials like this show us the poet at work, through drafts, revisions, cross-outs, and even in snapshots that came with the acquisitions. This dramatic insight into poets’ lives and daily practices has been made possible with Stuart Rose’s support,” Young says. Rose is chairman and chief executive officer of REX American Resources Corp., a large public alternative energy company based in Dayton, Ohio. In the last two decades he has built an extraordinary rare book collection, including a signed presentation copy of a first edition of Charles Darwin’s On the Origin of Species, which he loaned to Emory for a special exhibition in 2009. In 2011 he gave MARBL an assortment of rare books, a 22-title collection valued at more than $1 million. The collection includes in its original binding a first edition of Poems, the first book published by English Romantic poet John Keats; a theological study by St. Thomas Aquinas that is now MARBL’s oldest book; and a 15th-century volume of universal history, the Polychronicon, one of the first books published in the English language. Among the other books in the collection are rare editions of works by Emily Brontë, Rudyard Kipling, Giacomo Casanova, L. Frank Baum, Victor Hugo, John Maynard Keynes, and Charles Dickens. Rose’s 1653 first edition of Izaak Walton’s The Compleat Angler is held by fewer than 20 libraries in the United States. Open to anyone with a research interest, MARBL is one of North America’s major literary archives, with collections spanning more than 800 years of human history. MARBL curators are experts at organizing and presenting these materials, making them accessible to students, faculty, and visiting researchers from the United States and abroad. To learn about investing in the collections at MARBL, contact Alex Wan at alex.wan@emory.edu or 404.727.5386.